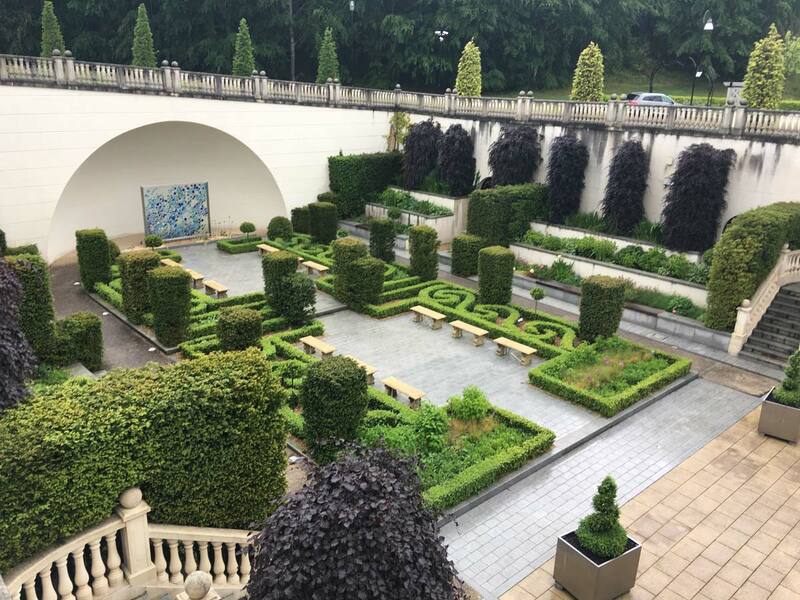 If you’re looking to spoil yourself with a luxurious dose of Irish country manor house, the five-star Powerscourt Hotel Resort & Spa is the place to be. 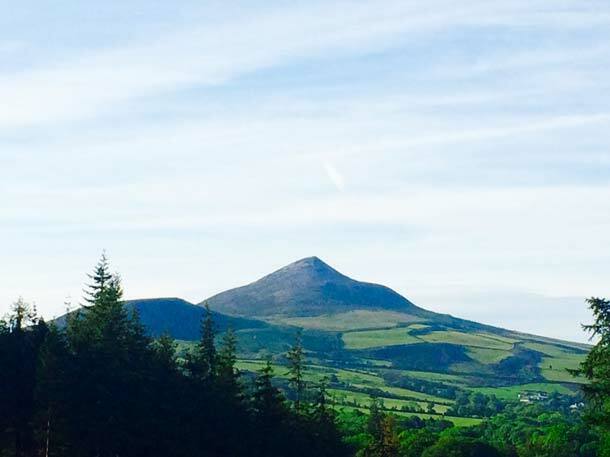 Located in Wicklow County, it’s an easy 15 miles (25 km) south of Dublin; 91 miles (146 km) from Kilkenny; and 112 miles (180 km) from the Rock of Cashel. It’s a great place to stay on your way to easy hikes at Glendalough. I stayed at the 194-room hotel for two nights at the beginning of my Ireland trip in May 2017. I was accompanied by my husband Brian and our two teenage daughters. We went there on our own; the hotel didn’t pay for any part of our stay, nor did they know I was planning to write a review. As a former senior editor for Departures magazine, and a seasoned travel writer, I had high expectations. Powerscourt did not disappoint! When we arrived, we were greeted at the door by a friendly butler in tophat and tails, as well as a fleet of able-bodied porters. The hotel is part of the Autograph Collection, and it’s wonderful for couples, singles, and families with kids (with a few limitations for kids; see below). For those used to staying at luxury hotels, you’ll find the service and accommodations wholly satisfying. The staff is here for you when you want them, ready to fulfill your wishes. But they will also leave you alone for your entire stay. Don’t expect private butler service you’ll get at a place like The Cloister at Sea Island (the luxury hotel in Georgia that I’ve stayed at twice, and enjoyed). There, staff will discreetly fold your clothes when you’re not in your room. It’s a nice service for those who like it, but I prefer to be left to my own devices (and fold my own clothes), knowing staff is available if I want or need them. If rooming at luxury hotels doesn’t usually fit into your budget, try to make an exception for Powerscourt Hotel. You can offset the expense by hunkering down in cheap B&Bs in smaller towns on your trip. You can also dine in the nearby small town of Enniskerry, which is a 10-minute drive away and offers less expensive dining options. The entire Powerscourt Hotel is oriented to face Sugar Loaf Mountain in the distance. Because the Palladian-style building is seven stories tall and located on a hillside, the ground floor level (where the lobby is located) is actually the fourth floor. You go down to the first floor to reach the 30,000-square-foot spa, ESPA. One of the restaurants (Sika), McGill’s pub, ballrooms, and some guest rooms are on on the third floor. The other floors just have guest rooms. When we toured the spa, we were invited to ride the elevators in our hotel-supplied white bathrobes and slippers to get there. We all did and had a good laugh over it. If you’re looking to relax with a good book, the lobby is a pleasant spot. Grab a velvet sofa in front of one of the gas fireplaces, and enjoy the classical music of the player piano drifting down from the balcony above. When we went to Powerscourt Hotel it was at about 80 percent occupancy, according to a porter we spoke with. In summer that number soars to 100 percent. 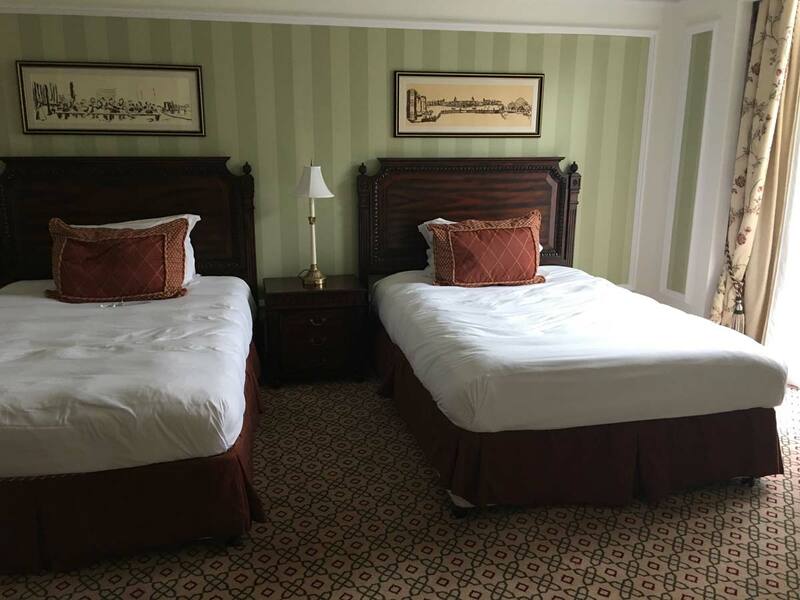 Back in the U.S., we’d booked a room online with two double beds. Every room at the hotel comes with a sitting area, marble bathrooms, free Wi-Fi, and a coffee-tea station. On average, rooms are about 700 square feet. There are recessed bathroom TVs if that’s your thing. But since there were extra unoccupied suites at our arrival, the hotel staff upgraded us for free to a suite with two queen-sized beds, a small living room, a dressing room, a patio, and a beautiful bathroom with a large bathtub and separate shower. What a gift! The shower had a rainhead fixture in the ceiling, which I loved. The furnishings were traditional and comfortable. The large-screen TV had all the movies you could want to watch. Also, you can add a rollaway bed for an extra 50 euros per night. A good option for families. The hotel grounds are home to several pretty gardens, including a flower garden and a small, woodland garden. Cross through it and you’ll get to a giant black-and-white chess set. My kids loved playing with it and swinging on the swings nearby. If you’re just in the mood to walk, you can wander the grounds freely. 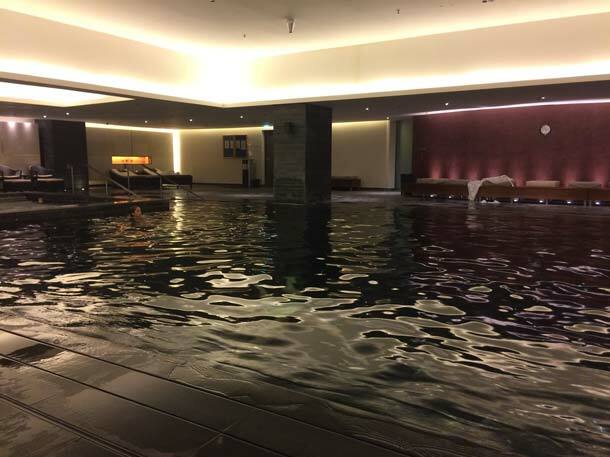 To relax inside the hotel, you can book spa treatments, but make sure to do so in advance. They were almost fully booked up for two days out when we arrived. You can also lounge in the sauna, steam room, and large Jacuzzi. There are men’s and women’s lockers rooms with towel service and hairdryers. The swimming pool is positively magical. The pool and deck are lined in black tiles, making the water look like a dark lake. White lounge beds surround it, graced with votive candles. Inside the pool there are Swarovski crystals that flicker in the lights. At one end is the large Jacuzzi, which can probably fit up to a dozen people comfortably. The pool has no lane lines but is about 50 feet long. If you go at the right time when it’s fairly empty, you could do some easy lap swimming. It’s open from 7 a.m. to 9 p.m. daily. Kids under 16 will have to accept that they have limited use of the spa. That means they can’t use the steam room, sauna, or Jacuzzi. They can only swim in the swimming pool between the hours of 9 to 11 a.m. and 4 to 6 p.m. And parents must accompany them. In case you’re thinking of breaking the rules, I was told them three times by staff. When we went during family hours it was full of the joyful sounds of children laughing and playing — not exactly romantic, but delightful if you’re traveling with kids. Also be aware that kids can’t be in the Sika restaurant after 8 p.m.
Other than that, children can move about the hotel and grounds freely! There are four dining options inside the hotel apart from room service. Sika is located on the third floor with floor-to-ceiling windows facing the mountain. It’s won Irish Restaurant Awards: best hotel restaurant in Wicklow and best wine experience in Wicklow. Dining at Sika includes contemporary Irish fare in a more formal setting. They serve both lunch and dinner. You’ll need to make reservations in advance, and you can book the chef’s table. The lunch menu has things like chargrilled Irish Hereford prime beef steak served with mushroom and port duxelle, broccoli, pepper sauce, and fries with rosemary and parmesan (24 euros). Or beetroot and ricotta ravioli with five herb pesto cream sauce (18 euros). From the dinner menu expect main dishes such as rack of lamb with rosemary and parmesan crumbs (30 euros), Glendalough gin-cured salmon (12 euros for the starter), and sous vide pork loin (26 euros). We had breakfast at Sika each morning, which was included in our room rate. It was a fabulous buffet with everything you could possible want. Waiters came around repeatedly bringing fresh tea and coffee. On the lobby level there’s a large dining area overlooking the grounds and lit by chandeliers that look like hot air balloons. Sugar Loaf Lounge is a good place to have afternoon tea, which comes with multi-tiered trays of pretty desserts. It’s served from 2:30 to 5 p.m. Prices start at 39 euros per person, or 52 euros per person if you want Champagne with it. Lunch includes dishes such as triple-decker classic club sandwiches (17 euros) and the Sugar Loaf salad with quinoa, Goji berries, and more (14 euros). You can also enjoy cocktails here by the bar. Reservations are recommended. The most casual option for dinner is McGill’s pub, located down the hall from Sika. It’s delightfully dark and moody, as a pub should be, but very clean. It serves from 6 to 10 p.m. nightly. You don’t need reservations, and it’s not open for lunch. Service and food at McGill’s are top-notch. I recommend the steak, ale, and mushroom pie (19 euros), as well as the cajun spiced chicken quesadilla (18 euros). For something fresh, get the baby gem caesar salad (11 euros). It’s a starter, but large, and you can add chicken if you like for an extra 4 euros. Located in the spa, it serves food from 12 to 3 p.m. daily. The idea is to dine around your spa treatments, so plan to eat in your bathrobe. 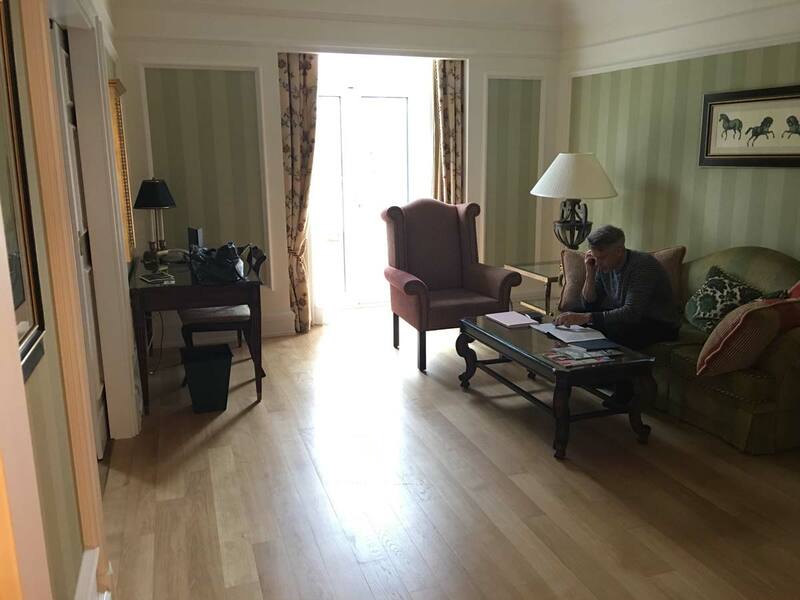 It’s yet another example of how the Powerscourt Hotel mixes formal luxury with casual comfort — and gave my family a memory we’ll cherish. Here’s a link to the hotel on Hotels.com. Here’s a link to the hotel on Booking.com. 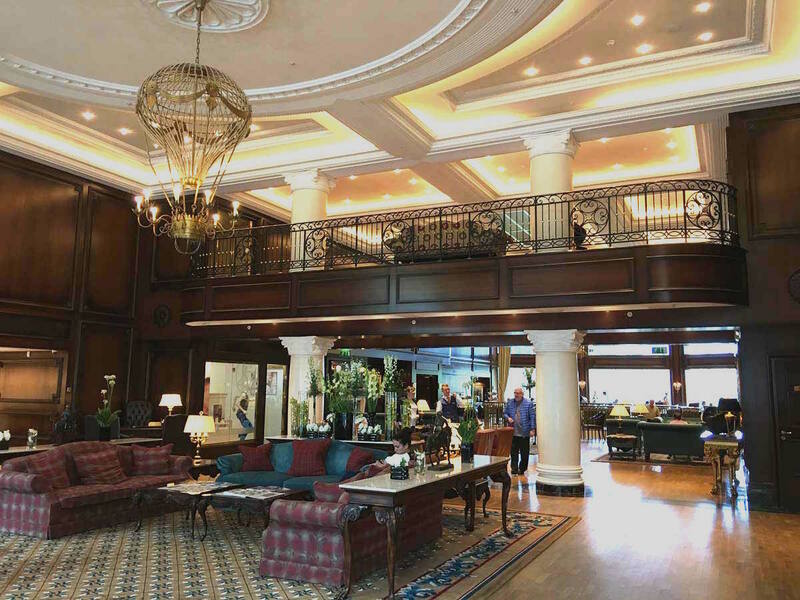 Have you stayed at Powerscourt Hotel? I’d love to hear your feedback in the comments section below! Powerscourt Hotel Resort & Spa is a top-notch place to vacation in Ireland, from the rooms and dining options, to the spa and service.